So after reviewing on bloop's nail polish, finally is time to introduce you their awesome product which is so easy and fun to use with - the bloop's Nail Strip! So as you can see, it's a kind of nail stickers/tattoo which you DIY. It can't be compared with nail polishes because they are two different products serve different beauty needs. If you just want a simple nail colour, or you want to have your own design that you able to draw them by yourself, you definitely need to use Nail Polish! 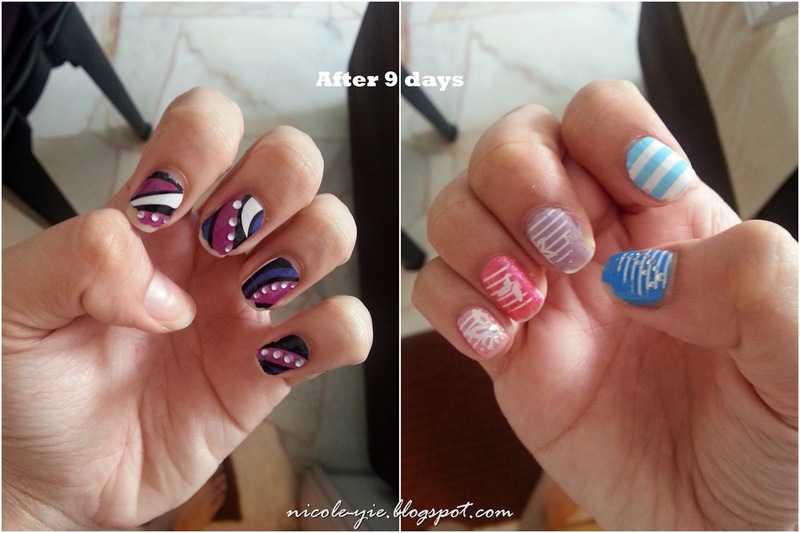 For those inexpert in drawing but #NailArtExpertWannabe like me, and you don't have time/money to visit nail salon for pretty nail art - Nail Strips are your best solution! A pack of nail strips comes with a small little cute nail file, which you will see how useful is it later on! Clean your nails with nail polish remover! Make sure your finger nails are a bit longer (at least 1-2mm of more) to apply Nail Strip, because it will be easier to file off the remaining extra nail strips nicely, and of course, longer nails with more designs are nicer right? Apply base/top coat or even nail polish if necessary on your nails. You will see some nail strips are a little transparent and you can match it creatively with different base colour on your nails! The base coat of nail polish colour will stabilize the Nail Strip and make it even last longer! To file off the strip, position the file at vertical direction and downward motion to file off the strip gently as shown in picture #7. -Do not do up and down motion as it may spoil the strip due to our nail strip designed was a bit thinner to ensure your nails are breathable. And Voila! You're done! 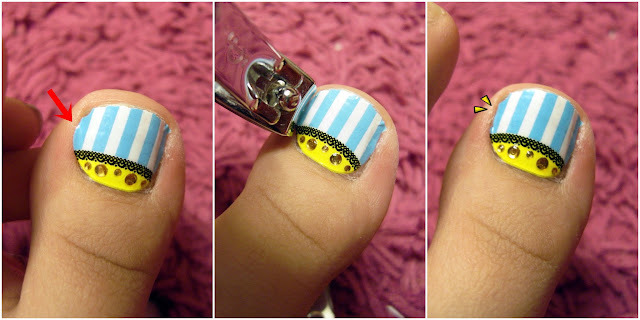 (picture #9) For longer wear, seal with a layer of bloop top coat nail polish. 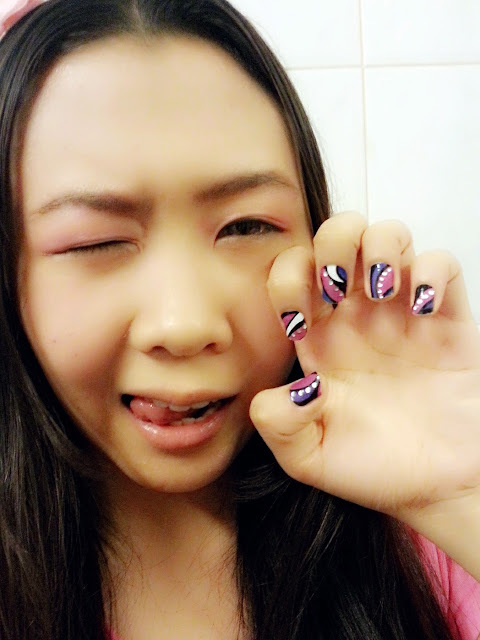 With my matching pink top, purple lens and pink eyeshadow make!! Now let me show you on the transparent design of nail strips! The transparent one is more fun to play with because you can match it with different base colours of nail polish before you apply your nail strips! The steps are the same as I mentioned above. The only add on is the colour. As seen above, I applied the bloop's nail polish which I used for the nail polish review here. Be creative to play with it!! The index finger's was actually taken from the left over strip from the toe strip! And the same procedure goes to Toe Strips as well! The shape is cuter as our toe nails are normally wider and shorter. My toe nails are always short. So instead of filing the strips of vertically, I do it horizontally because it's easier to do so! 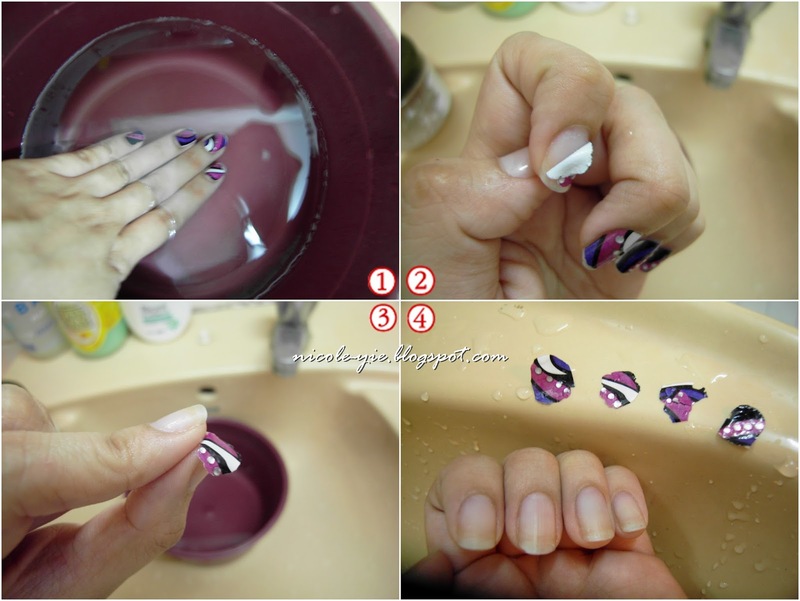 Dip nails into warm water for 5-10 minutes. 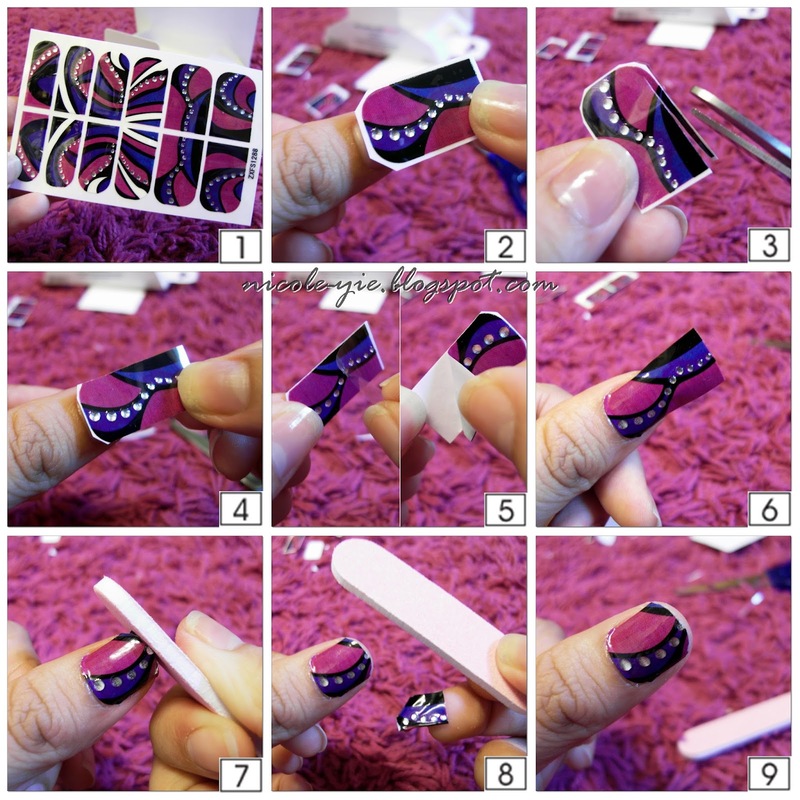 Gently peel off nail strips. Remove any excess glue with bloop nail polish remover. Sometimes I really love to DIY own stuffs or anything on myself is because I learned something new every time when I try to do it by myself!! If I didn't get to try on this nail strip, I won't experience on how easy making own DIY nail art is! 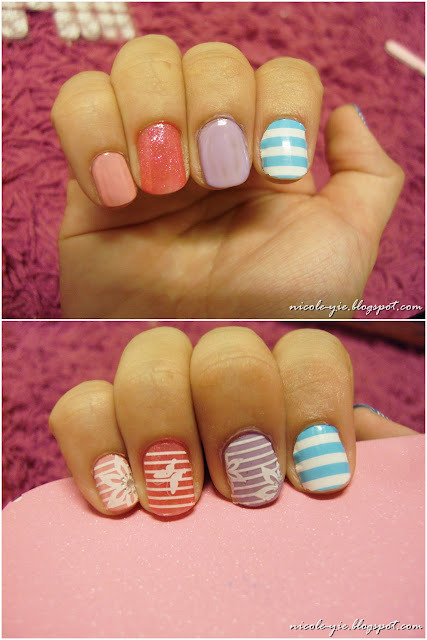 It is really as easy as applying nail polish, in addition, it's more fun to play with! I didn't tell my little cousin (10 years old only) that I did anything on my nails, but after she saw it, she said "OMG your nails so nice! You went to nail salon right??!" And I was like "Nawwhhh I do it by myself! ;)"
Designs are limited, even though it has a wide range, but sometimes it doesn't have those that we wish to have in our mind. I actually peeled off the left thumb nail's strip few days ago when I was in Cameron because I used my thumb to do a lot of things like open bottle cap and wash dishes, so of course it will drop! Want to try it on now?? Here's a good news for you! HiShop is selling bloop's nail strips at only RM38 for 3 packs!! 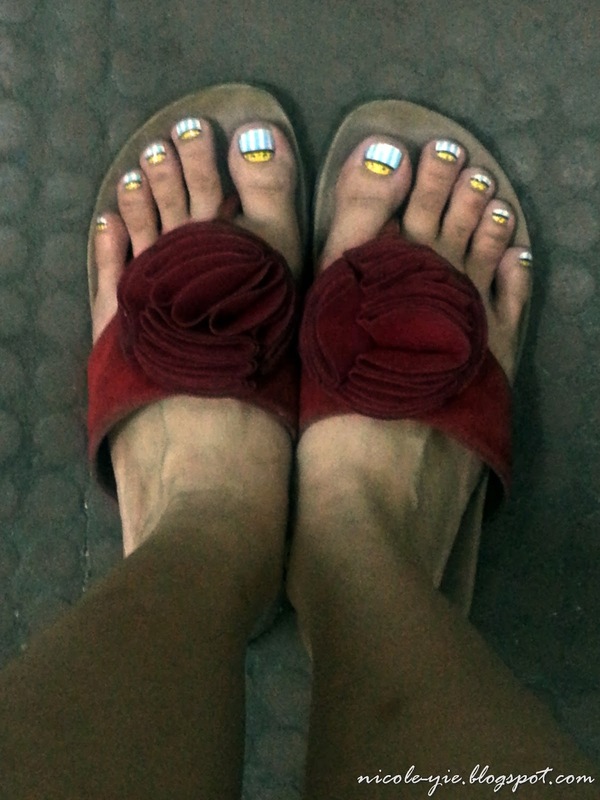 Which means each pack of pretty nail arts cost you only RM12.67! (Normal price: RM12.90 each) It's still cheaper than go to nail art salon right? 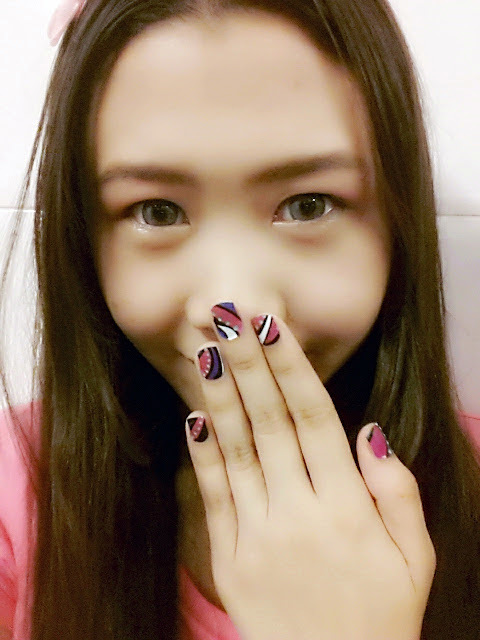 :3 Click here to choose your favourite design of bloop's Nail Strips now!